In a PT's event, Lula said: "I don't want to be a candidate to protect myself. I want to be candidate to govern"
Brazil's former president Luiz Inácio Lula da Silva accepted his nomination to represent the Workers’ Party (PT) in this year’s presidential election. 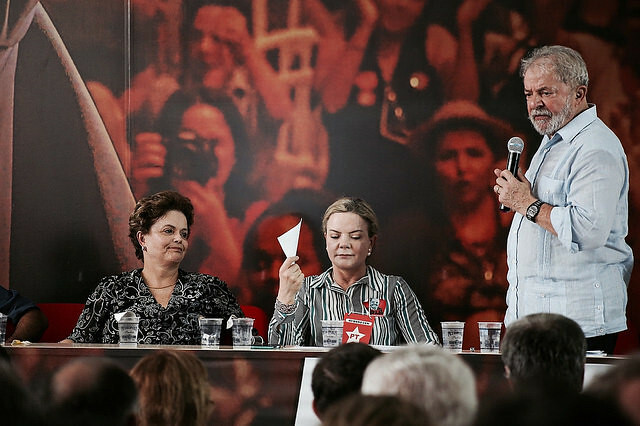 During his speech, on Thursday in a PT's event, Lula da Silva went on to say that in order to guarantee an electoral victory next October he must relay on public participation and the support of popular movements. "I want to be candidate to win the election and govern this country," Lula stated. "What I can offer you all is my innocence. I don't want to be a candidate to protect myself. I'm not accepting the pre-candidacy for this. My protection is my innocence. If it is to be a candidate, it is to govern," Lula added. A Brazilian appellate court on Wednesday upheld a legal appeal filed by former President Lula da Silva against a corruption and money laundering conviction issued by a federal judge last July. However, during the nomination ceremony, Lula da Silva maintained his innocence and reiterated his concerns regarding the legitimacy of the court decision, saying: "The judges acted like party leaders, not members of a court." Several high-profile artists, intellectuals and public officials attended Thursday’s rally including member of the national coordination of the Landless Workers Movement (MST) João Pedro Stedile, President of the Brazilian Workers Party (PT) Gleisi Hoffmann, and former president Dilma Rousseff. “Lula is not just the PT candidate, he is the candidate of the people. People of this country will not be fooled. They understand that the Judiciary branch is not committed to serving the Brazilian people," Stedile stated. Gleisi Hoffmann, for her part, highlighted another reason why they want to make Lula's presidential candidacy unfeasible. "They want an election without Lula for a simple motive: they change their faces to continue applying the coup. I want to reaffirm here that it is no alternative plan and that Lula is our candidate. They said we were isolated. How someone who has more than 40% voting intention can be considered isolated? ".